PepsiCo, accused of depleting drinking water around the globe, has set bold new goals for water stewardship. Is this bluewashing? Fresh water is one of the most abused resources in the world. Hundreds of millions of people lack access to the stuff, even in urban areas. The problem isn’t helped by our reliance on soda and junk food that require large amounts of water for production. Food and drink giant PepsiCo claims in a new report that it is doing its part for water stewardship. But is this just the latest version of greenwashing–bluewashing? PepsiCo has certainly set some ambitious goals. It wants to improve water use efficiency by 20% per unit of production by 2015, while providing access to safe drinking water to three million people in developing countries by the same year. The company aims to do most of this by establishing public-private partnerships. 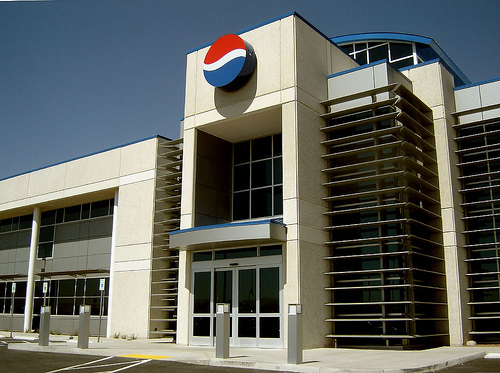 And PepsiCo already made strides in improving its water use. The company is on track to provide clean drinking water to a million people in drought-heavy areas by 2011–via public-private programs that construct rainwater harvesting systems, improve public sanitation, and establish water health centers in countries such as Brazil, China, Ghana, and India. PepsiCo also claims that its India manufacturing team has cut water usage by 45% since 2005, saving 3 billion liters of water. And in one Frito Lay facility in Casa Grande, Arizona, a water filtration and purification system recycles 80% of all water used in production. quality” Earlier this year, the junk food giant was accused of depleting local groundwater near one of its India plants. And how can a company that shills bottled water to millions of people who do have access to clean tap water claim that it practices good water stewardship? PepsiCo’s water stewardship report at least indicates that the company knows there is a problem, and that it is taking steps to become part of the solution. But we’ll know the company is really getting serious when it takes a more critical look at its Aquafina brand.